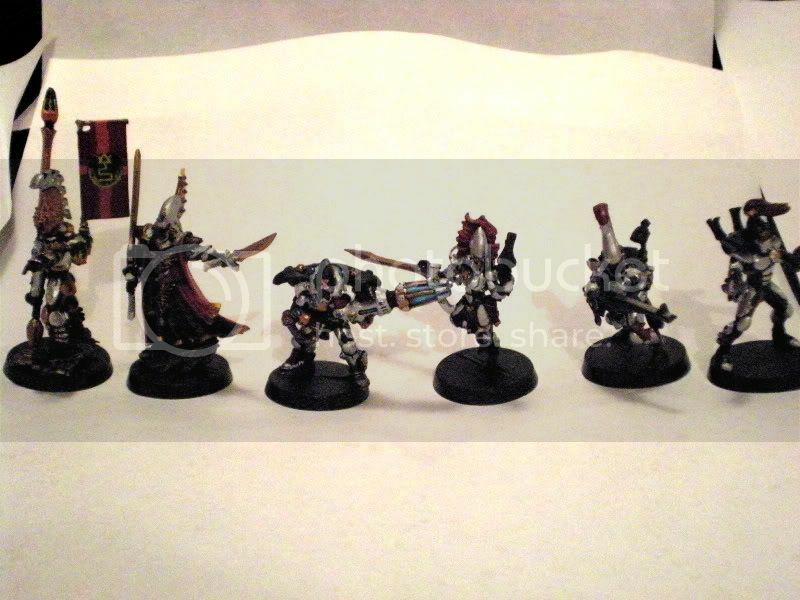 Warhammer 40k Forum Tau Online » Warhammer 40K Armies » Craftworld Eldar » Color schemes! Post yours! Post pics, describe them, whatever! I&#39;m interested to see/hear what other players are using on their Elfdar. My army was originally going to be Regal Blue and Skull White...then I realized that my Guardians looked like Dire Avengers, so I changed it to Blue and Black. They were then the walking bruises. Eventually I settled on Chaos Black and Liche Purple, but the vehicles are so hard to paint on a black basing...so I&#39;ve changed it up again, and I&#39;ve struck gold. My new scheme is a Codex Gray basing with washes of Liche Purple. It makes it look like it shimmers purple, and gives it a kind of earthy appeal that I don&#39;t see a lot of with Eldar. Mine are white, with gold details. I paint my vehicles all gold, and my aspect warriors their respective colors, but with gold trim. I&#39;m very happy with it! I&#39;ve got a link to a painter for eldar. It&#39;s okay, needs extra work in photoshop if you want it to look really good. The metalics are not that good at all. But it is nice to try out some ideas before you start to paint actual figs. Yes, solid gold, but it looks quite good. Not near as flashy as you might think! Craftworld Tri-Authren uses a primary of black with silver plates, bronze details/blades, red hair/fabric, and blue or green gem stones. My aspect shrines juggle similar schemes with minor differences. Here is a terrible picture of a few of my models. Sorry my camera is terrible. Did I kill this topic? I was really interested in learning about my fellow TO Eldar peers color schemes. I&#39;m not sure. It&#39;s possible. For what it&#39;s worth, I think your color scheme is pretty sweet. I always like it when people aren&#39;t slaves to the aspect colors. It turns a cool army into a friekin rainbow! Yeah, I wanted my Craft to look much more...Uniform than the technicolor dream coat most Eldar armies look like. Thanks for the complement! I dig the blue too, it was a lot of fun doing the layering for it. Its kind of hard to see, but he has a freehand black widow mark on his helmet too, all my Warp Spiders do. You should post a picture of your golden tank! I&#39;d love to see it.